There are days that can only be described as Romans 8:28 days, when all I could do was put my faith and assurance that God was working things out for good. My friend, Katleen Ping, was gunned down in April at Oikos University by a madman. Throughout the next few weeks, from her memorial service to her funeral, Romans 8:28 ran through my mind and the lips of those around me. Of course the Bible is more than a single verse; there are verses that correspond to every day of the year. June 4th became Deuteronomy 6:4 day, June 23, Romans 6:23, and of course March 5th and 6th became Proverbs 3:5 and 3:6 days. If we could dedicate a day to memorizing a verse, we'd be so much richer when we need to cling onto a verse to get us through the day. "I think the concept is that this is a new way to get personal with the Bible and a new way to think about the Scripture. What does this verse mean to me, today?" "Never thought of it this way. So what's my birthday verse?" "Cool, I never could think of a life verse, you know how Sunday school teachers ask you to come up with one? Now all I have to do is look at your book." January was easy wheezy. Every book of the Bible has a first chapter and there were so many verses to choose from. I quickly found all my favorite verses, Romans 6:23, John 3:16, Romans 10:13, Revelation 3:20, Philippians 1:6. Mathematically, the choices diminished as the end of the month approached, and even more so at the end of the year. Many chapters ended before thirty-one verses and some of the smaller books did not have twelve chapters. But as God foreknew everything, I did not come up empty. Long books like Romans, Matthew, Mark, Luke and John quickly became favorites. And whenever I had difficulty, Proverbs came to the rescue. Hebrews chapter 11 took care of quite a few November verses, and Matthew provided November 28-30 whereas Mark finished December 29-31. The Christmas verse is especially touching and appropriate for Christ's mission on earth. 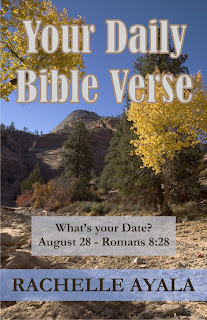 Your Daily Bible Verse (366 Verses Correlated by Month and Day) is available at Smashwords and Amazon. This book is dedicated to Katleen Ping, 1987-2012. Please comment and let me know what you think. Did you find your verse?